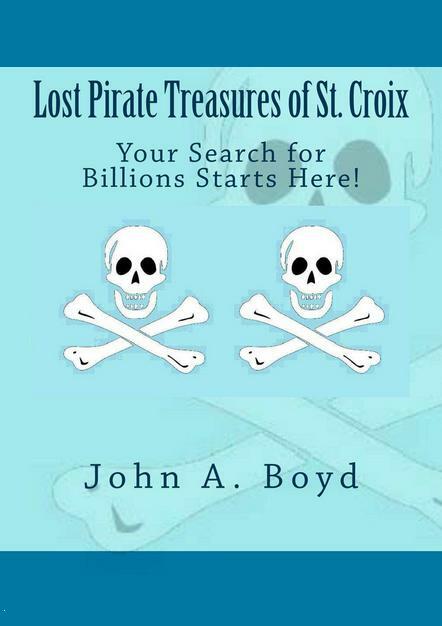 My new book, “Lost Pirate Treasures of St. Croix: Your Search for Billions Starts Here!” has been published and is available from Amazon in both Kindle Book and Paperback Book. This is my second book carried by Amazon, but the first time that they picked it up in one day and are stocking a couple of copies already so I guess they think it will sell well. I will not get my copies for distribution on St. Croix until sometime in late September. Anybody who wants to start searching for billions can get a head start by buying it from Amazon. Over the past six months I have been compiling all of the information about Pirate Treasures that have been lost to history on my home island of St. Croix. Throughout the past thirty years I have lived on the island, I have been told by all credible historians that there were no pirates on St. Croix so of course their would be no pirate treasures. Besides that fact, pirates were a bunch of foolish drunkards who had no reason to bury treasure when they spent it all so quickly. 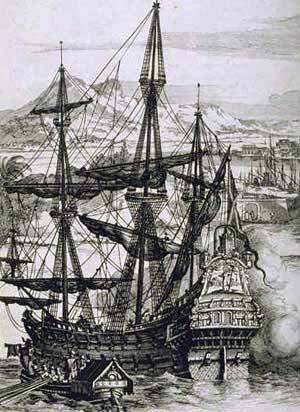 Well thank goodness for scholars of past centuries who documented the pirate presence. 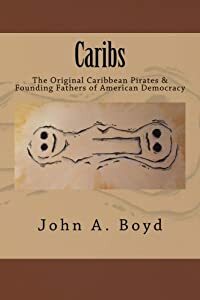 My research documents the presence of several pirates who made St. Croix their home base and discusses the high probability that at least three of those treasures are still well hidden on the island. I am indebted to three proof readers who got caught up in the project and shared my excitement for treasure hunting and adventure. I will tell each of their stories separately in future posts. My long time friend Mario Golden has moved to Georgia but like many others, we remain in touch through facebook (facebook.com/hikestcroix). He has been following my various activities of hiking and writing and I follow his eclectic news reports and the informative posts that he finds on everything from muscle cars to current events. Mario didn’t just want a copy of my book, he wanted one with a personalized autograph and he inquired as to how much I would charge. After thinking about it, I replied that the book Was $24.00, the postage for Priority Mail was $6.00 and my signature was priceless (LOL). However since I was flattered that this native son wanted a copy, the total price was $30.00. Shop early for birthdays, holidays and especially Christmas. For those who want to save $6.00, all of the copies at Under Cover Books (Gallows Bay) are autographed, just not personalized exclusively for you. Moses in the Rushes (Tradescantia spathacea or Rhoeo spathacea) is on five continents as an ornamental or medicinal plant. In has been used in it’s native Mexico as anti-fungal and anti Cancer drugs and is still used in modern medicine as part of a treatment for cancer in that country. Naturally, it’s use was documented in the Mayan pharmacopoeia which people in Mexico, Belize, Guatemala and Honduras are working to reconstruct. Throughout the rest of the world, it is sold as a potted ornamental and for a ground cover although some people in Asia use it for medicinal purposes. 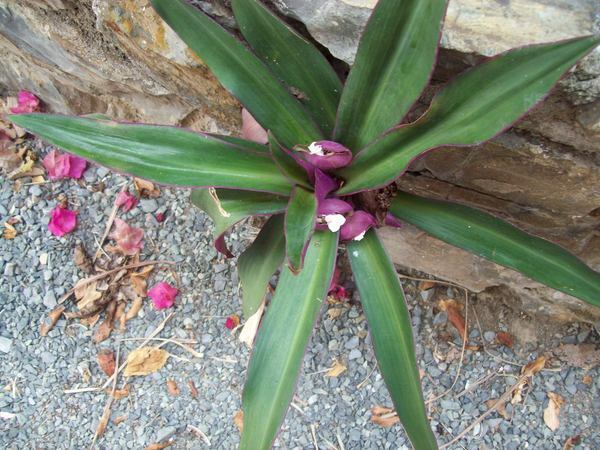 If the tiny three pedal flower looks familiar along with the purple underside of the leaf, it’s because the plant is a close relative to the “Wandering Jew” (Tradescantia pallida ). Despite being sold as a ground cover it is actually rather poor for that use, at least in the tropics. As a ground cover it does not grow fast enough or dense enough to completely stop airborne seeds from growing. Where there are large areas growing, there are also vines, shrubs and trees that need to be weeded. 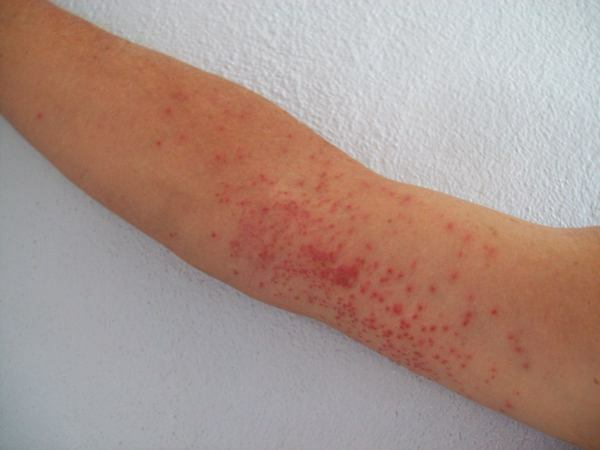 Now if that is not bad enough, the really ugly part is it is poisonous if eaten in large amounts and Moses-in-the-cradle causes rashes and other reactions if it contacts your skin. Unlike poison ivy, this plant does not attack everybody. Ugly – The rash it gave me when I harvested a bushel for a friend who wanted to use it as ground-cover. Neither she nor her husband got a rash when they planted them! Still, when on Vacation, be careful of the flowers you pick. The last thing you need is a trip to the Emergency Room after all the pharmacies are closed. It’s been months (five) since I’ve published anything about hiking on this blog as all my writing time has been focused on my book. 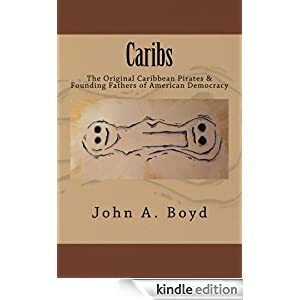 It’s not that I’ve quit walking or going on hikes, I have just been spending all my desk time devoted to finishing and publishing my book, “Caribs:The Original Caribbean Pirates & Founding Fathers of American Democracy” which is available in a (Kindle Edition) and (Paperback Edition). Since I can only stand to sit at my desk about five hours a day, I have still been hiking and looking for new historic trails to walk as the Island of St. Croix has 5000 years of Amerindian occupants and over 500 years of European occupants. Unfortunately, there are several problems with the Judith’s Fancy location, not the least of which is there is no tower in the vicinity of the ruins. Also, a 1920 report by the USGS places the castle high on a hill (303 foot) instead of the flat lands of Judith’s Fancy. While both sources place the castle to the north of my house, there are no hills in the area with ruins on them and none are above 238 feet. Like all good mysteries, I started with an old Map from 1671 and ended with a feeling that I was replaying the spooky ending of the Da Vinci Code including a muscular young guy (bare to the waist) and a couple of unrestrained pit bulls. 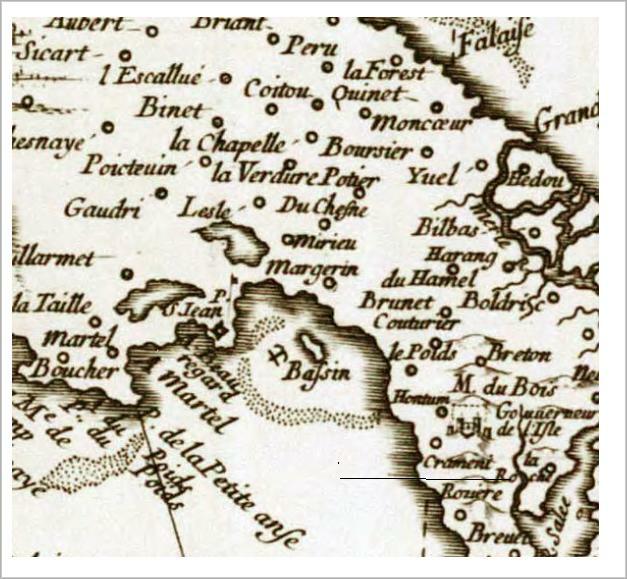 The French Map of St. Croix from 1671 is drawn in a manner that South is towards the top of the page. 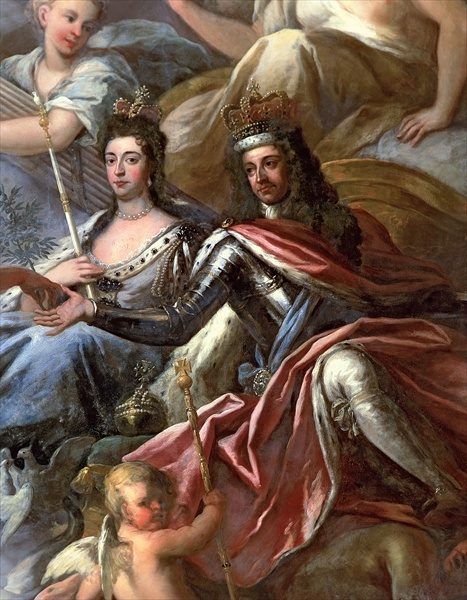 Over the years as ownership changed from French to Danish to American, there have been several changes in name and only those who study history are aware of the old names. The same 1920 inventory of estate names refers to the top of the Hill I live on as Crameni or Soldier Hill. It is now referred to as Judith Hill but that is unnecessary because the map is good enough to place my house on Crameni Hill with Christiansted Harbor (Bassin) to the East, Salt River to the West and Judith Fancy to the North. In this map, the Governor’s castle is shown on a hill almost due South of Crameni. The next step was to get a copy of the 1958 topology map of St. Croix and check the topology and roads on the hill south of mine now identified as Judith. Indeed, their is a road which takes you to the 300 foot level and it shows houses on that road prior to 1952. Interestingly enough, the road does access Queens Quarter and so I got two friends to take a hike so we could explore any ruins. Before we could reach the end of the road as shown on the map, we found a house built in the middle of the road blocking our path. 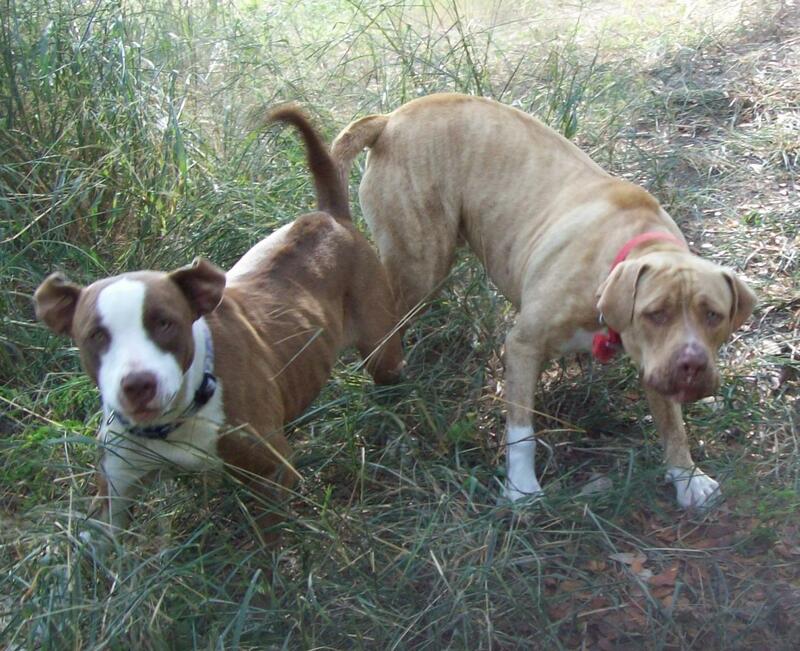 And then, we were attacked by two very aggressive pit-bulls. Now I always carry a walking stick and one friend uses “the voice”. I guess these dogs have never heard of Darth Vader because they kept on attacking him. I was able to keep the one dog at bay with my walking stick but that only made it worse for my friend as both dogs went after the guy who relies on his voice to tell the dogs to go home. After the dogs had backed us 50 feet down the street, a young man came out of his house wearing only shorts and attempted to call the dogs back. They ignored their master until they backed us another 50 feet down the road. Once he had the dogs under control, I asked him if I could take a picture of Christiansted Harbor from the public road. He answered his father doesn’t like that and the dogs were not yet completely under his control so I missed a very scenic shot. Now this would be the end of the story if Google Earth did not exist but I decided to go back for another look or to to see if there were any ruins on the hillside. 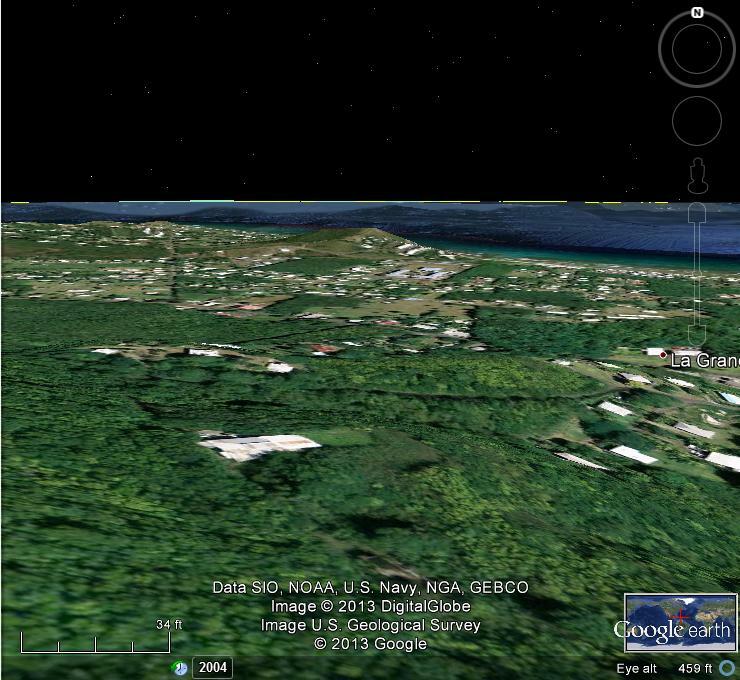 The shot below shows a ruin over the word Navy at the bottom (center) which when you look due north points to my house on the opposite hill. 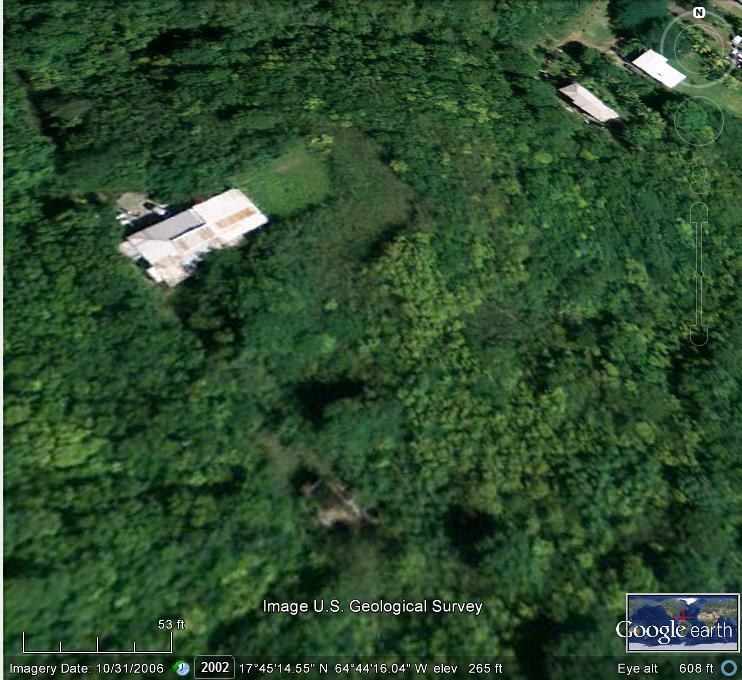 The final picture is as close as I can get on Google Earth without breaking up and shows an exceptionally large house on what appears to be an artificial plateau. The house appears to block the historic road and access to the ruins. 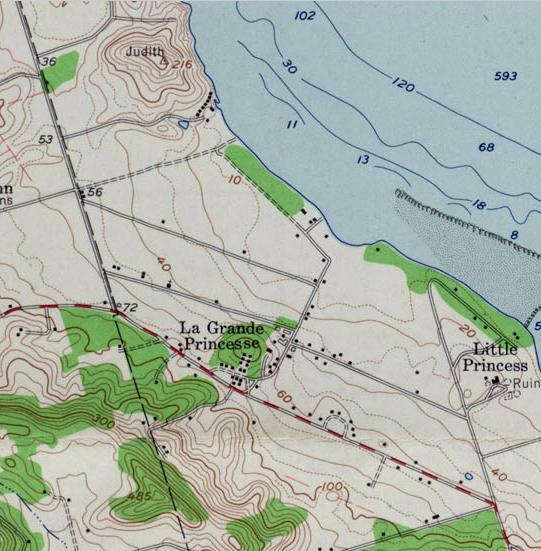 The plateau is clearly visible on the 1958 topology map. The interesting aspect about the ruins is on the east side where there is a circular base for a tower. It is unlikely this is a windmill as it is down hill from the square building and all windmills were built uphill from the factory with the cane juice running downhill. One possible explanation is that this is a “small chateau with [one] unusual tower” and is the Governor’s Castle. Now whether this is the Governor’s Castle from the Knights of Malta Era or not should not be the message of this post. When walking in areas new to you, you should be aware of all Safety issues. The biggest ones in St. Croix not only includes dog attack, but there are issues with insect bites, dehydration, toxic plants, lack of cell phone coverage in some areas and no easy way out if you have problems. Most of our older hiking guides have the experience to keep you out of harms way.